Having a healthy thyroid is the key to maintaining a well-functioning metabolism and feeling your absolute best. When your thyroid, a butterfly shaped gland located in your neck, isn’t working right you can feel downright lousy. The reason for this is that the thyroid’s main role is to produce hormones that help regulate metabolism, which can include controlling your heart rate, your mood, your energy, and impacting how well you use calories from food. 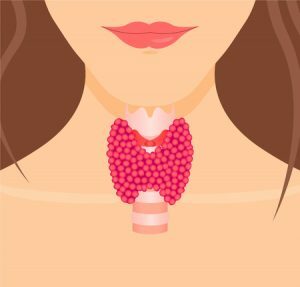 There are several health conditions that can affect thyroid function, but all these cause one of these two types of thyroid dysfunction, either hyper- or hypothyroidism. Hyperthyroidism is when the thyroid produces too many hormones, whereas hypothyroid is when the thyroid becomes sluggish not producing enough. Both types of thyroid issues can affect how you feel, your mood, your energy and your weight. When the thyroid is overactive and producing too many hormones some common symptoms are a racing heart, restlessness, anxiety, and irritability. On the other hand, when the thyroid is not producing enough hormones, hypothyroidism can cause fatigue, depression, memory problems, weight gain, and constipation. The treatment for thyroid disorder depends on the type of dysfunction, hormone levels, medical history and overall symptoms. Treatments can include medication, hormone replacement, and radiation therapy. But, aside from medical treatments there is a lot you can do with your diet to support and improve the health of your thyroid. First, since approximately 75% of people with thyroid dysfunction are autoimmune related, we should start with healing the gut and following a gluten-free diet. These two changes go together to help improve thyroid function. In addition to breaking down food, one of the purposes of the digestive tract is to prevent harmful substances from entering the body. To do this, the cells along the gut wall remain joined together through tight junctions. These tight junctions are allowed to open and close, deciding what is permitted to be absorbed into the body and what should not be allowed in. Do you remember the game of Red Rover? In this game you stand side by side, holding the hands of the person next to you. You call someone over and make the decision if you will allow them to “break through” your junction or keep them out. This is similar to the tight junctions in your gut. Sometimes, for a variety of reasons, small gaps begin to open up between these cells and the junctions are no longer tight. This allows unwanted and possibly harmful substances to pass through. 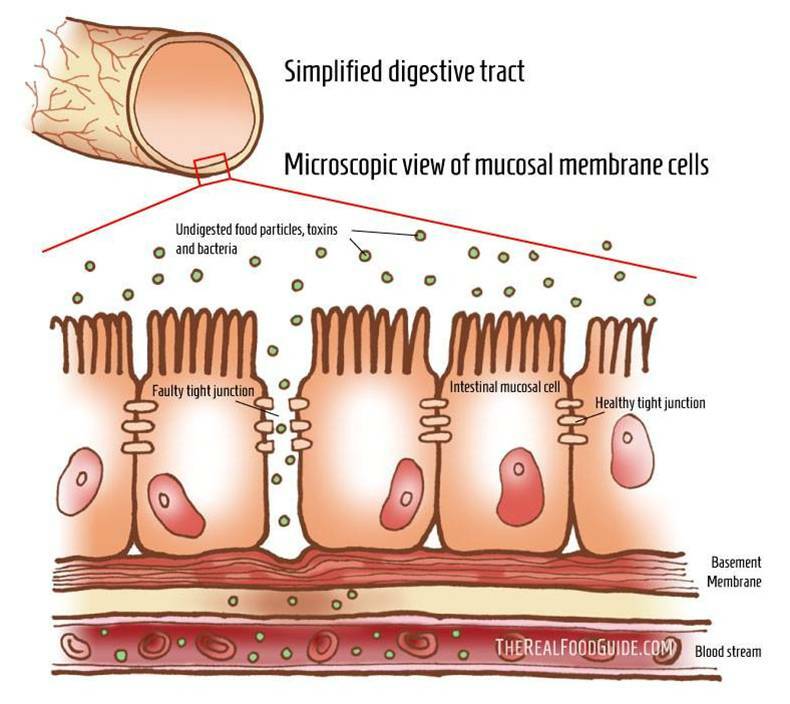 This is called intestinal permeability (the intestine becomes penetrable by various substances) and is also commonly referred to as “leaky gut”. Gluten is one of the molecules that pierces through the tight junctions, forcing them to stay open. In addition, when the cells have gaps between them the gluten molecule can pass through holes getting absorbed into the blood stream. This creates a cascade of immune reactions. Gluten is a protein found in wheat, barley, and rye. As with most proteins, it needs to be broken down into its individual components, called amino acids, in order to properly enter the body. But since gluten can break the bond of tight junctions it can also get absorbed into the blood stream before being completely broken down. The body has a defense system right outside the gut wall, immune cells waiting to attack any foreign invader or harmful substance. When gluten passes through whole, these immune cells begin to mount an attack against the whole gluten protein, which they see as a threat. Now the body has essentially created an immune attack against gluten, which it is supposed to do. The problem is that the gluten protein has a similar structure to the proteins found in the thyroid. In some people, the next time these immune cells come across thyroid cells, they will treat them the same way as they do gluten, and attack. This is why many thyroid issues are autoimmune, they are caused by the body attacking itself. Eliminating gluten is the first change that is necessary for healing the thyroid by way of improving leaky gut. Other foods that may also be problematic for the gut include soy, dairy, nuts, and eggs, but the elimination of these will depend upon your own individual sensitivities. Healing the gut doesn’t only involve eliminating gluten. You also want to support the healthy bacteria that live in the digestive tract. To do this include more fermented foods in your diet, which naturally contain probiotics, or healthy bacteria. Some of these foods include: sauerkraut, fermented vegetables, miso, yogurt, and kombucha. Once you have eliminated gluten and are on the path to healing your gut, you need to focus on making sure you are getting enough thyroid-supportive micronutrients in your diet. This is ideally achieved by eating food that naturally contain these nutrients, before relying on a vitamin and mineral supplement. As you can see, good nutrition is critical for thyroid health, as the thyroid needs a variety of nutrients to function properly. But, a diet for a healthy thyroid is just as much about foods to avoid as it is about what foods you need to include. So, start by healing the gut, avoiding gluten, and eating fermented foods to support on-going digestive health. Get tested for food sensitivities if necessary too. But, also start eating foods that support your body and your thyroid, naturally. Keeping your thyroid healthy can help you feel and look your best. How do you support your thyroid?